I have a problem that I have been attempting to solve for a few days now. I was wondering if I would be able to get some assistance from the community. In order to detect if a point is in a polygon, I am using the winding number method. The algorithm is based on what I found on this site here: http://geomalgorithms.com/a03-_inclusion.html. In short, the algorithm will return a result that will indicate if the point is to the left or right of a line segment. For CCW orientation of the line, positive results mean that the point is to the left of the line and negative values indicate that the point is to the right of the line. The signs are switched for CW orientation. If the number of "lefts" is greater then the number of "rights", then the point is inside of the polygon. 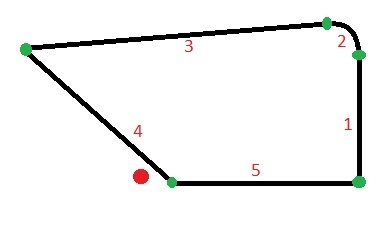 Lines whose endpoints are between the point are only considered in order to speed up the algorithm. Now my polygons (I use this term loosely) are composed of both arcs and line segments. These polygons are simple and do not loop back on themselves. The polygons can either be convex or concave. As a side note, arcs in my program are represented as circular arcs. This implementation mostly works but, from the picture below, the red dot would be given as a false positive. The winding number algorithm would indicate that the red dot is inside the polygon when it clearly is not. From the algorithm, line 1 will indicate that the point is to the left and line 4 will indicate that the point is to the right. But arc segment 2 will indicate that the point is also to the left and thus the point is inside of the polygon. Now, the implementation with the arcs has another fault where the algorithm will return a false negative. Below is a picture of geometry where the point in the center would be outside of the polygon and the point off to the side is inside. This polygon is composed of only arcs. For a few days now, I have been considering different implementations but so far, nothing has panned out. Another thing about the arcs is that they are all in the CCW orientation. Whether the arc is concave/convex depends on which node is selected as the first node. I am considering moving back to the ray crossing algorithm but I would like to see if I can get this to work first. I am fine with if I have 2 different algorithms for lines and arcs (in fact, I think that I will). I ideally, I would like to utilize the winding number algorithm but I am open to additional solutions. // First, the algorithm will need to ensure that all of the lines are oriented in either CCW or CW. // Each contour, the order of the lines is CCW or CW but the order of the nodes is different. // For example, the start node of the 1st line could be "connected" to the end node of the next line. // In which case, we need to swap the nodes of the 1st line. * a line from the first node to the mid point and then from the mid point to the second node. * We will use these two lines as the calculation for the shoelace algorithm. Then, given a point to test, you can first figure out whether the point is inside one of the boxes. If it is not, then if it is inside (outside) $P'$ (easily testable) then it must also be inside (outside) $P$. On the other hand, if the point is in one of the boxes that enclose the arcs, then you'll have to test whether it is on one side of the arc or the other -- but that's easy because an arc has such a simple structure. Not the answer you're looking for? Browse other questions tagged computational-geometry mesh geometry modeling or ask your own question. Ray casting algorithm for multiple disjoint polygons is still valid?